I love this time of year when the temperature reaches 75F – 80F degrees during the day, and a comfortable 65F – 70F degrees in the evenings. It’s perfect for outdoor grilling and backyard parties. Lighter fare appears to be what most people gravitate towards these days. While I try not to load up on my carbs too often, one dish I’ve found everyone enjoys is my Caprese Pasta Salad. Whether serving it as a side dish at my barbeque or bringing it to a friend’s house, guests always come back for seconds, and thirds. If you’re not familiar with the Italian term “Caprese” [kuh-prey-zey] it means, of or in the style of Capri. It’s a dish oftentimes prepared as a salad with fresh mozzarella, tomatoes, and basil leaves, drizzled with olive oil. My version contains these components with the basil portion in the form of pesto. Pesto is a sauce that originates in Genoa in the Liguria region of northern Italy. It traditionally consists of garlic basil, and pine nuts, blended with olive oil, and Parmigiano Reggiano. Of course you can purchase ready-made pesto at the grocery store, but for a fraction of the cost do yourself a favor and make it homemade – it’s so easy, and tastes superior to the store bought brands. If you’re not a fan of noodles try using a Spiralizer (watch video) creating vegetable noodles with zucchini, for a no carb version. Would you prefer serving this as a main dish? Add chicken or shrimp for a heartier meal. However you prepare it, this salad is outstanding, and holds up well outdoors! Pesto: In a food processor, place pine nuts, basil, garlic, and sea salt and process to a paste. Add the cheese and drizzle in the olive oil. Continue blending until smooth. Pasta: Prepare pasta as directed on package; drain and rinse with cold water to stop the cooking process. Place drained noodles into a large bowl or platter. Add tomatoes and mozzarella balls to pasta. Liberally add pesto and mix to combine. Add salt and pepper to taste if desired. Serve at room temperature or chill until ready to serve. Note: Store unused pesto in a jar, topped with a thin layer of olive oil. Pesto can also be used in many other dishes: from dips to spreads, with fish, chicken, meats, on sandwiches, and other pasta just to name a few. Once you make your own pesto you’ll never buy the jarred variety again! I so agree with you that homemade pesto is good stuff. 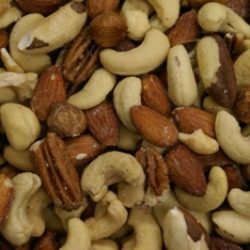 I usually substitute walnuts for the pine nuts these days (loads cheaper, and pretty good flavor IMO). Can’t wait until by basil is ready to harvest! This is a lovely dish — thanks. 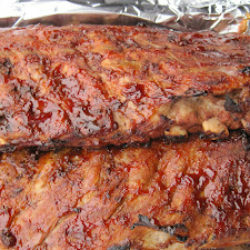 This look mouthwatering, Vicki. And yes, the caprese sauce would be great with zucchini noodles too. I could LIVE off this salad!!!! I will make a batch for my lunches very soon!!! 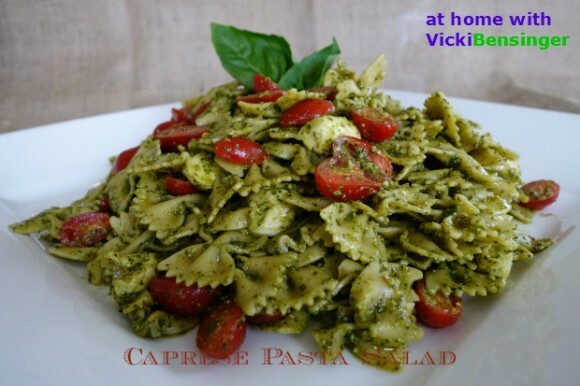 Delicious looking pasta salad Vicki…I love the pesto sauce…perfect for the Summer. I love the addition of the pesto sauce – and yes, much cheaper to make at home! I go wild for anything with pesto. I can’t believe I have never made pesto before! This looks freaking fantastic! My little basil plants will be wanting to make these when they get bigger this summer 🙂 I’m a big fan of the flavors of Caprese so can’t wait to try it! Would be great for a Memorial Day BBQ too. 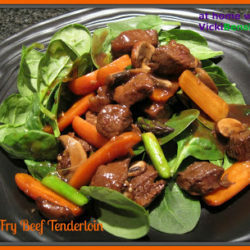 This sounds like a wonderful salad Vick, just loaded with flavor and pretty color. I can see why this is a hit with so many! Oooo does this look delicious! I love pesto! My kind of salad! We both could live on pesto every day! 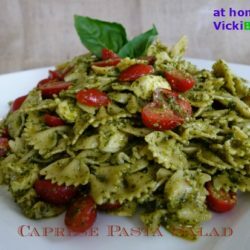 Vicky, your caprese pasta salad looks just as delicious as we had in Portofino a few years ago! I planted 4 basil plants this year, so I’m hoping for lots of basil and lots of pesto! It’s only good fresh. 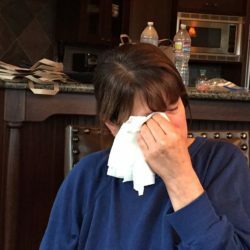 Love your recipe and the pasta – yum!